An energy efficient dehumidifier is always the better choice when we are selecting the best model to deal with our humidity problems. Most dehumidifiers for the home are Energy Star® qualified and many reviews imply that the Energy Star label alone is a guarantee of energy efficiency. Don't get me wrong here. I am not saying anything against the Energy Star partner organisations or their program. Energy Star does an excellent job and is a boon to consumers. A 25 pint model with Energy Star qualification is a more energy efficient dehumidifier than an unqualified 25 pint unit. That's helpful to know but that is all it tells us. It does not help you or me to understand why a 50 pint model may be a more energy efficient dehumidifier than any 25 pint unit, Energy Star qualified or not. It does not help us to understand why a 50 pint may last longer than a 25 pint model, thereby saving you even more money and helping to reduce your carbon footprint. These and many other complex issues are explored on the Energy Star website but how many of us have read through every page? All of us want the most value for the least cost. In the case of a dehumidifier that means an appliance that does the job, creates the least inconvenience and costs the lowest amount. Many of us also want to care for the planet and will add a fourth factor; that our appliance should do the least possible amount of damage to the environment. Let us look at each of these factors in turn. This is the simplest of the four factors to understand. We bought the dehumidifier to reduce and control excess humidity. If it fails to do so every penny we have spent is wasted, the inconvenience is monumental and the damage to the environment cannot be justified. It is not enough to be an energy efficient dehumidifier, it must be fit for purpose. 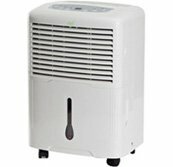 This is really a catch-all factor that bundles together all those aspects of a dehumidifier that make it more or less easy to live with; noise level, ease of use, timer, continuous drainage, size, weight and so on. The value attached to each of these characteristics will depend on the user, her situation, priorities and preferences. If a quiet appliance is your top priority, for example, you may be prepared to pay a higher price to buy it; the decision is yours. This is really pretty simple. The costs of a dehumidifier are made up of two elements; cost of purchase and running costs. Cost of purchase is the ticket price, including any shipping cost and additional warranties. To this must be added any repair costs, outside those covered by the warranties, and the sum divided by the number of years the appliance lasts before needing replacement to give a "cost per year". The only running cost worth including is the energy used to operate the unit, once again expressed as a cost per year. The running costs will almost always exceed the purchase cost which is why choosing an energy efficient dehumidifier is so important. Assuming your appliance uses an ozone friendly refrigerant, which most now do, minimizing the cost of the dehumidifier to you is also minimizing environmental damage. An energy efficient dehumidifier uses less electricity. You save money and carbon emissions are reduced. A unit that lasts longer needs replacing less often. That not only saves you money but reduces the need for dehumidifier manufacturing, which benefits the environment. It's good to know that doing your bit to save the World also saves you money! You will find more information on our dehumidifier costs page. This is one of two factors that are seldom fully considered when searching for an energy efficient dehumidifier. Most dehumidifiers are effective at removing water from the air but there are large variations in the quality of design and build between one brand and another. As I have explained, the reliability of your appliance is of major importance to the cost of ownership and the cost to the environment. Many of you will read reviews written by consumers when making your choice and will pay particular attention to comments about reliability. I encourage you to do so. We do the same to inform our recommendations to visitors. If you decide on a portable for your home, in your basement perhaps, read as many reviews as you can digest and then come back here and see the recommendations we make. I would be surprised if you disagree with our selection but please let us know if you do. A second aspect of fitness for purpose is more easily overlooked or, perhaps, misunderstood. If, for example, you have a basement that is relatively cool, below 65°F, for significant parts of the year a portable may be a poor investment, and certainly will not be an energy efficient dehumidifier. If you have a large basement, and would need two portables, they would certainly be the wrong choice. A purpose built basement model is a dramatically more energy efficient dehumidifier, particularly at lower temperatures. It is also built to far higher standards and has a longer life expectancy than a portable unit. Many folks are deterred by the high ticket price of these units but, as we explain on this page, these can often be the cheaper solution when the annual cost is calculated in the way described above. This is the core of the issue. If we compare two Energy Star qualified models, say a 50 pint and a 70 pint, which is the most energy efficient dehumidifier? Perhaps surprising to some, the answer is the 70 pint. Because energy efficiency improves as the size of a dehumidifier increases the "Energy Factor" which must be achieved by a 70 pint unit is higher than that required by a 50 pint. A 70 pint is always a more energy efficient dehumidifier than a 50 pint. The Energy Factor (EF) is the volume of water extracted by a dehumidifier per kilowatt hour of energy consumed. A 50 pint model must achieve an EF of 1.6 litres per kilowatt hour, a 70 pint dehumidifier 1.8 lt/kwh. In other words the larger unit extracts more water for every energy dollar spent to run it. 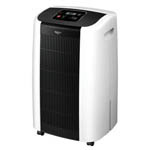 Both are Energy Star qualified but the 70 pint model is a more energy efficient dehumidifier. For a more complete explanation see our 70 vs 50 pint article. Because a 70 pint unit also extracts water more quickly it operates for fewer hours per day to maintain a programmed level of relative humidity. Fewer hours of operation means a longer working life which, as I have explained, reduces the purchase cost of the appliance calculated on an annual basis. 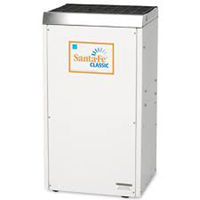 The conclusion is that an Energy Star qualified model is always a better choice but that the best, the least expensive, the greenest and the most energy efficient dehumidifier is usually a more powerful model, even when this seems to contradict "common sense". Some of you may find my arguments and conclusions about choosing the most energy efficient dehumidifier a little surprising, even quirky! After all, most web sites you visit will not shape their recommendations in the same way; I'm sure they have their reasons. 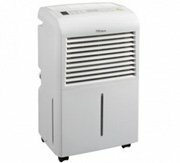 This site is devoted to telling you about dehumidifiers "the way it is", but we are not alone. A growing number of sites realise that their visitors are looking for information, not just "sales copy" but these sites are still too few in number. You will find a very similar point of view expressed there on this popular and highly regarded site.